Located right near Jabal Khazali, we are Bedouins who want to share our hospitality with you at Wadi Rum Caravan Camp. With our nomadic roots, we understand and respect nature, striving to protect it as we enjoy it. We are famous for our hospitality, in which you will enjoy a comfortable stay with us and delicious traditional food. For each night you visit, you will be provided with a place to stay as well as dinner and breakfast. A boxed lunch is provided for an addition JD5 so you can spend the day hiking around the area. An evening buffet of traditional Bedouin salads, hummus, pita bread, fruit, and barbecue. Wadi Rum Caravan Camp is a large campsite that can accommodate groups of any size. We have 18 permanent tents, with two beds each. We have more tents which we can set up near the camp if you prefer to get away from the group. Or, if you enjoy looking at the endless night sky, you are welcome to sleep outside. Sleeping bags are encouraged, but we do have blankets as well to provide for you. 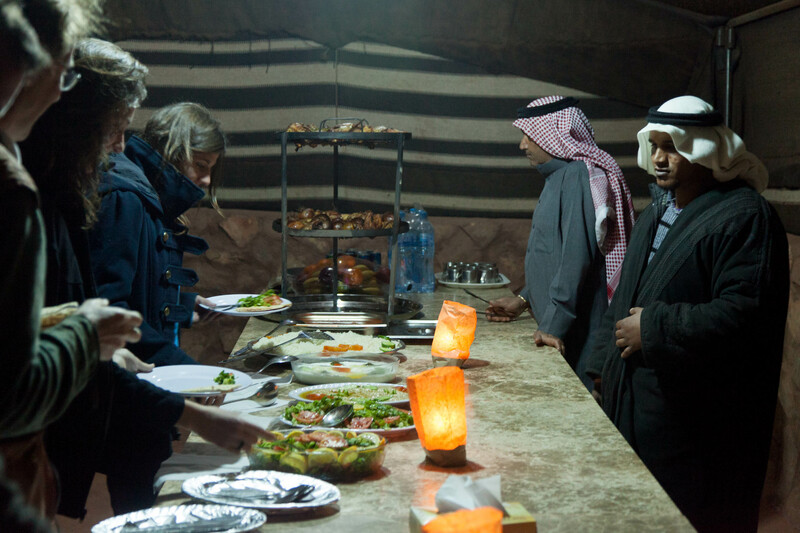 Inside the camp we have a kitchen in which we prepare traditional Bedouin meals. From magluba and mansaf, to Bedouin barbecue, you will get to taste our culture and our sweet tea around the fire or in our large common tent. This common tent has places to sit as well as a table for the nightly buffet. Outside we have a large fire and benches for sitting, singing, and dancing. Additionally, we have a bathroom with hot water, 4 toilets and 4 showers. You will need to bring your own towel, as we do not have any at the camp. At night we turn on a generator for a couple of hours, giving light to the kitchen and bathroom, also allowing you to charge electronic devices or anything you need. However, you will need a torch beyond this time if you need anything at night. During the day you are welcome to wander around the desert as you choose. We can help give you recommendations of good directions to hike, as well as arrange Jeep or camel tours, and guides for hiking or climbing. The view from the tents. The bathroom with four toilets on the right and four showers on the left. Atallah, one of the two camp owners, in one of the tents. Abdallah, the other camp owner, in the camp. Two local men sitting by the campfire, enjoying an afternoon in Wadi Rum. Atallah and Ghassan, preparing dinner. One afternoon in Wadi Rum Caravan Camp. A guide with a traveler from France enjoying tea after a day of hiking. Two travelers around the campfire. Atallah and some help, brining dinner from the kitchen to the buffet. Nighttime in Wadi Rum Caravan Camp. Digging up dinner from the underground fire pit. Main course at one evening meal at Wadi Rum Caravan Camp.